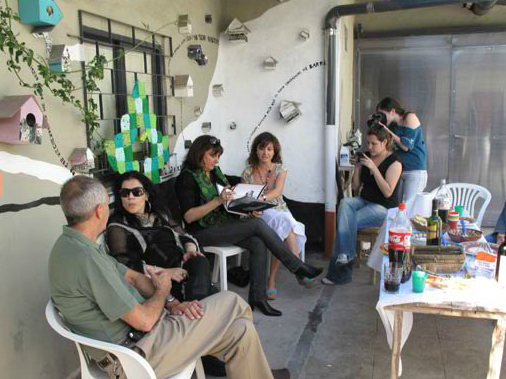 Mission: Zona Imaginaria is an open and active space, designed to enable the research, exchange experiences, and training of artists with a strong inclination towards the exchange and interpersonal relationships. The Workshop and the House are closely related. The Workshop designs seminars and courses while the House develops the project of residence “Who can live in this house? ”. 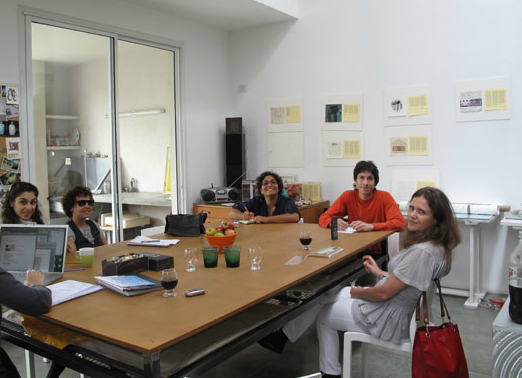 Between both, they bring together local and international artists with neighbors, thus directly linking the production of each artist with the neighborhood in the context of contemporary art. Zona Imaginaria was conceived from the need to create a space, a state of creation and since 1993 this concept has been growing with me, evolving while traveling to different places and countries where I lived, as a rolling idea. In 2008, in Villa Jardín, San Fernando, this long traveled idea found where to settle, and Workshop and House have taken root, to grow and finally open its doors. 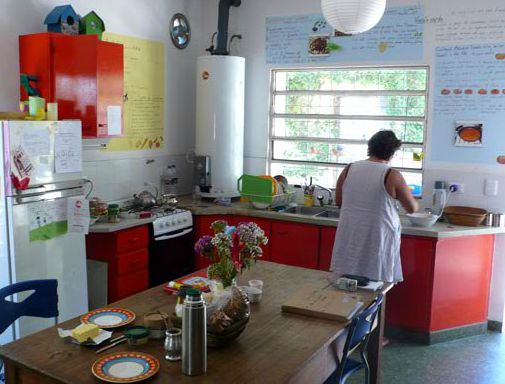 Accommodations: The house has several spaces such as: a wide kitchen and dining room, two bathrooms, a TV where everybody can see video art, a constantly growing library, three bedrooms, two big patios where the “Vegetable Garden” workshop takes place and a ceramic and glass studio where the workshop “Pequeños Aprendices” is taught to kids from the neighborhood. The home also features the Vegetable Garden on the sidewalk, and the Studio, which is equipped for Contemporary Graphic. 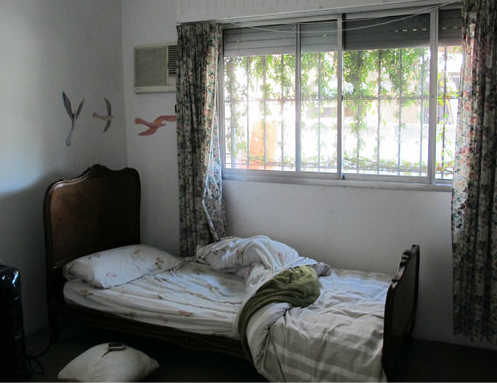 The house is located in Chile 3386, Victoria, San Fernando, just a few meters away from Uruguay Street, which divides San Isidro from San Fernando. 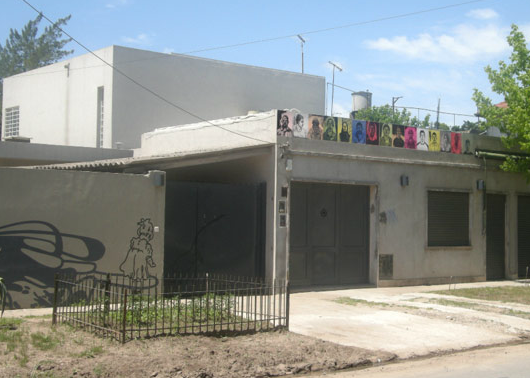 This street is not a just a mere district division but a wall, which until March 2009 was invisible, dividing one of the most exclusive areas of Buenos Aires, the suburb of La Horqueta, from a humble neighborhood, consisting mainly of workpeople of San Fernando. In April 2009, the mayor of San Isidro gave visibility to a problem that had been going on for years in the area and built a wall that aroused the fury of neighbors, the community disapproval and the rejection of the Government and which was quickly demolished. Walls, wherever they are built, make any possibility of integration instantly annulled. The intervention of this space and the critical reflection in this context implicates, necessarily, dipping into social issues and involves the categories of territory and social space. Demographic/Medium: We open the doors of the House and invite artists from different disciplines, countries, cultures, backgrounds, histories and ages to take the space as a temporary home, to intervene it, inhabit it, manipulate it, as well as to send mail art and make donations to the library and organic media library, while the House also continues to function as such. We also invite critics, artists, curators, neighbors and nearby industries reflect and enable a dialog with the neighborhood and to “open the doors” to new concepts of “society” and “sponsorship” to art, from art. Benefits: (see above). Community, social-based, intervention, social structures, workshops, all mediums, critical engagement. 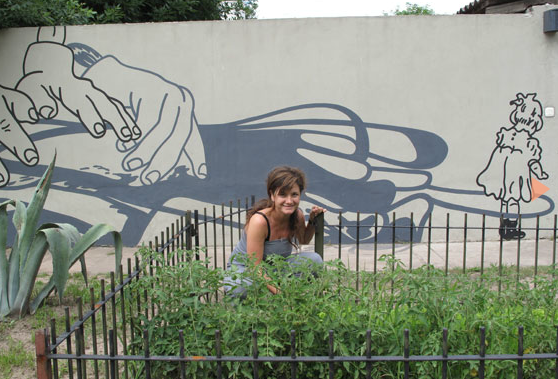 Both neighbours and artists participate in the Huerta project, supported by the Pro-Huerta program of Inta. Agriculture Ministry of the Nation. Posted in Argentina, Zona ImaginariaTagged Argentina, Art, art residency, Artist Residency, artists, bedrooms, Buenos Aires, ceramic studio, community, contempoary graphic design, Contemporary Art, courses, critics, curators, education, glass studio, Graphic Design, House, inhabit, international artists, intervene, La Horqueta, library donations, local, mail art, manipulate, media library, neighborhood, neighbors, networking, no application, no application deadline, nonprofit, ongoing deadline, relationships, research, San Fernando, San Isidoro, seminars, social, social issues, social space, society, space, sponsorship, Uruguay Street, vegetable garden, video art, Villa Jardin, workshop, Workshop and House, Zona ImaginariaBookmark the permalink.